Forging, is one kind of metal forming processes that uses forging press to exert pressure on metal billet to produce plastic deformation to obtain certain shapes and dimensions. Forging and casting are all the oldest known metalworking processes with long history. The art of forging and metalworking is found in human culture as early as 4,500 B.C. Traditional forging process was operated by a smith using hammer and anvil, for iron parts by introducing water power. Until 12th century, large trip hammers or power hammers are used in forging process, which greatly improved the production efficiency. Several centuries was taked before forging become industial metal forming process in a facility, which includes raw material, forging press, frequency furnace, heat treating, machining workshop to produce metal components. Modern forging is operated with the workforce of forging presses or hammers mainly powered by electricity. The current forging process is open to produce complex shaped components in both steel, aluminum and brass. With forging, no matter it is small or large, round or long, all dimensions are available. There are multiple options of hot forging. There are basically three methods (or processes) to make a forged part: Open die forging, closed die forging and rolling forging. Open die forging and closed die forging are the most two common drop forging processes that use pressure and temperature to modify material, but different uses of dies to form the metal. Open die forging is the forging process shaping a piece of metal between multiple dies while keep the metal in a open status that not completely enclose the material. The metal is worked at temperatures ranging from 500°F to 2400°F and is shaped into the desired shape through hammering or pressing. Most of these forgings or made on flat dies, but V-dies, round swaging dies, pins, mandrels, and loose tools are also used depending on the specific part. Open die forgings produce strong, durable parts in sizes that range from a few pounds to hundreds of tons. As a result, it is a favorable method to produce large and simple parts such as bars, rings, blanks, hollows, and spindles. Open die forging is a great open forging process to obtain high strength large products. Closed die forging, also named as impression die forging, is the forging type that uses pressure to compress a workpiece to final shapes under forging dies. In closed die forging process, several types of impression dies may be used to form final desired shape. The type of material, tightness of tolerances, and need for heat treatment can determine the number of passes the product requires through the dies. With closed die forging, we can produce all types of precision metal components. Most metal alloys can be forged via closed die forging process, among them: carbon and alloy steels, tool steels, and stainless, aluminum and copper alloys, and certain titanium alloys. Strain-rate and temperature-sensitive materials (magnesium, highly alloyed nickel-based super-alloys, refractory alloys and some titanium alloys) may require more sophisticated forging processes and/or special equipment for forging in impression dies. Roll forging is a forging type that utilizes opposing rolls to shape a metal part. Even though roll forging uses rolls in order to accomplish the deformation of the material, it is classified as a metal forging process and not a rolling process. More similarly to metal forging than metal rolling, it is a discrete process and not a continuous one. Roll forging is usually performed hot. The precisely shaped geometry of grooves on the roll, forge the part to the required dimensions. The forging geometry of the rolls used to forge metal parts is only present over a portion of the roll’s circumference. Only part of a full revolution of a roll is needed to forge the work piece. Typically in manufacturing industry, the forging geometry on the rolls may occupy from one quarter to three quarters of the roll’s circumference. Roll forging manufacture is often used in the automotive industry to manufacture parts. Shafts of various geometries, knives, hand tools and leaf springs, are some products commonly manufactured by this process. Parts created by roll forging possess superior mechanical properties than those produced from many other processes. Steel is the main material type used in forging. We call this type of material as “forged steel”. According to the chemical composition of steel, steel used in forging can be classified as carbon steel, alloy steel and stainless steel, among them, the forging ability of stainless steel is the worst for its bad metal liquidity. Forged steel is the right selection for its low cost in many applications. Besides, forged steel has three times as strongth as aluminium although it is much heavier. The forging process creates parts that are stronger than those manufactured by casting or machining. Forging takes advantage of the metal’s natural grain flow, shaping the grain flow to conform to the contours of each part’s unique geometry. This grain flow contouring is lost when cutting through the grain by machining it and is also lost when casting parts. Forging offers a single piece versus a welded unit, as the weld quality can be hard to replicate without additional inspection. Forging can produce metal components as complex as possible while better properties than casting. Forgings can be nearly any shape, which reduces the need for joining multiple pieces. Reducing the joint can improve the overall strength of the unit as the forging does not need to be welded or otherwise fastened together. Almost all ferrous and non ferrous metals can be forged. 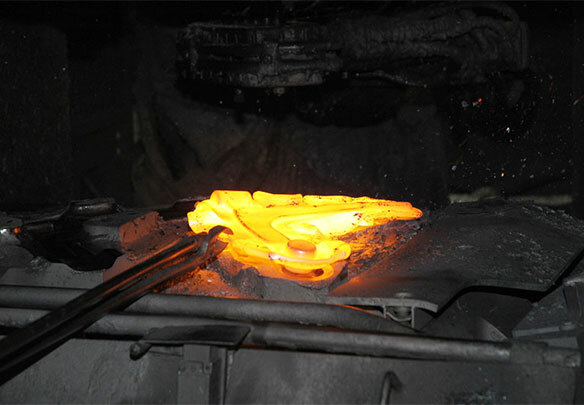 Forging reduces the weight required to manufacture the piece, therefore, there is a real and significant cost savings. Also, less machining is required and machining cost can be reduced or saved. Of course, there are also limitations of forging. Not all the shapes can be obtained after forging. And it is not cost effective to produce small quantity products as initial high tooling cost is charged. Strength, reliability and economy are the desired characteristics for automotive application. Forging can offer high strength metal components with excellent performace. Widely used forging components for automotive applications are connecting rods, yorks, rocker arms, axle beams, wheel spindles, shafts, kingspin, torsion bars, ball studs, pitman arms, idler arms, and steering arms, ect. Due to the superior mechanical properties and free porosity, forgings are often used to for high pressure applications. Most common forged components are: valve body, tee, elbow, coupling, hammer union components, ect. Corrosion and heat-resistant materials, such as A105, are required when producing such products. Lots of metal components are fitted to forestry and agricultural machinery equipments. Considering the special working condition, wear resistance and high strength are always needed. Forging can improve the strength of metals, and provide good wear resistance with the use of wear-resistant material, such as 42CrMo. Typical forged components for agriculture and forestry applications are: Flail hammer blade, tub grinder teeth, ect. Forgings find application in mining and construction applications owing to their high strength, toughness and machinability. Common forged components for mining and construction applications are: foundation drill bits, auger bits, bucket teeth and other components. Forged components are found in almost every implement of defence, from rifle triggers to nuclear submarine drive shaft, all comprise forged parts. For aerospace application, high strength-to-weight ratio and structural reliability are the most significant properties required. Forged components for aerospace application are like buckets, discs, blades, couplings, rings, manifolds, chambers and shafts. We are the premier forging company in closed-die solutions. With totally eight production lines in house, we can produce forgings range from a fraction of a pound up to 100 lbs. Our capabilities in materials include multiple grades and types of steel, depending on the end use. Carbon, alloy and stainless steels can all be forged. We also offer a range of additional machining and heat treatment services, allowing us to stay competitive and directly supply finished product to our customers. Fly Forge is a comprehensive forging solution manufacturer and exporter in china that aim to provide high quality forgings to our customers. In addition, we are ISO 9001, API and TS16949 certified. Our engineering team utilizes various computer modeling techniques and the latest technological capabilities, as well as extensive physical testing. We offer our partners a dependable link in their supply chain by constantly focusing on quality, short lead times and competitive pricing. Each forging, no matter how complex, is also backed by our ongoing customer service and expert engineering. Would like to source a forging company in China? Contact us for a quote first!